Here at Piera’s Bridal the topic I seem to get the most questions about is veils! So today I am here to help with some of the most common veil questions I am asked, and to show some beautiful examples of veils we have here! What length veil is best with my dress? The honest answer is… whatever you love! There really isn’t a right and/or wrong length veil to wear each style of dress. What are the different lengths of veils? At Piera’s Bridal we classify veil lengths first by body part. Single layer veils are usually elbow, fingertip, knee, and ankle length (also known as waltz length). Veils that are longer than you are tall are called cathedral or chapel length. 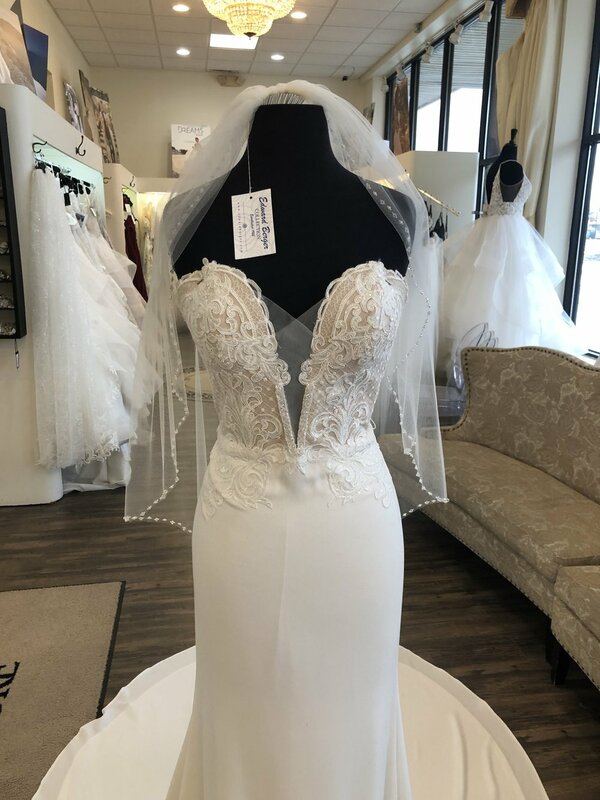 Cathedral length veils are typically the same length or longer than the train of your dress, these veils can vary in length depending on the length of the veil itself or the length of your train. A typical cathedral veil is 108-120” long. Chapel length veils are a little shorter than a cathedral, usually just sweep the floor. Most of the veils we carry can be custom ordered in different lengths. If you love the edge of one of our cathedral veils but were wanting to wear a fingertip length, no problem! Or if you were feeling a little “extra” and ordered a dress with a super long train and needed one of our cathedral veils made longer we can accomodate that on some styles too! What is a blusher and do I have to have one on my veil? A blusher is a veil that goes over your face- usually when you are walking down the aisle. It is one of the oldest wedding traditions that was used to protect the bride against evil spirits! Now many brides like the tradition of having the blusher lifted by whomever is “giving her away” at the end of the aisle. Some veils have a double layer or are circle cut making the blusher part of the actual veil. Other single layer veils can have removable blushers attached to them. Having a blusher on your veil is completely up to you! We have many brides ask us for them, but also many who choose not to have one. They do make for some AMAZING photos though! My dress is lace, do I have to have a matching lace veil? Nope! Sometimes it can be difficult to find the exact same lace from your dress on a veil. If you have lace on your dress and would like lace om your veil I recommend finding a veil with lace that complements your dress, or find a veil with the same style of lace. There really isn’t a “right” or “wrong” veil to choose based on your dress. Just like your dress, your veil should be a reflection of YOU and your style! At PIera’s Bridal we have a beautiful selection of veils that range from simple and classic, to show-stopping and elaborate!